An InputMethodContext interface, which provides attributes, events, and methods to interact with current UI state of IME. This API is designed to be used in conjunction with UI Events [[UI-EVENTS]]. No one is actively working on this spec nor its implementation at the moment. Additional Editing help wanted. Experimental implementations exist in Google Chrome and Microsoft Internet Explorer 11 & Edge (prefixed). This document is a proposal that is being made available for public review in order to solicit feedback, particularly from implementors, with a goal of potential cross-browser implementation and standardization. Even though existing Web-platform APIs allow developers to implement very complicated Web applications, such as visual chat applications or WYSIWYG presentation editors, developers have difficulties when implementing Web applications that involve input-method editors. To mitigate the difficulties, the UI Events specification [[UI-EVENTS]] introduces composition events to retrieve composition text while it is being composed in an associated IME. However, Web applications can still run into difficulties interacting with IME, such as detecting any UI overlap between IME candidate window and its underlying UI elements. To solve the IME-related problems, this specification introduces an IME API that allows Web applications to interact with the IME. This specification introduces InputMethodContext interface. They can work independently of this API. Please also refer to the separate use cases for Input Method Editor API document for more information about possible use cases. For other possible improvements for interacting with IME, please refer the IME API annex document as a non-normative reference. This example is a simple web search page which gives a user search query suggestions while the user is doing composition. This example code hides the suggestion box when IME candidate window may overlap with it. // example, but of course other input field changes should also be handled. // Register handlers for candidate window appearance change. // Sends an XHR request to get search suggestions. // Upon receiving the result, expandSuggest() is called back. // For brevity, implementation of this function is omitted. // Callback after getting search suggestions. // Render new suggestion list. // Hides suggest window once IME candidate window is shown. // Unhides suggest window once IME candidate window is closed. Background: What’s an Input Method Editor? An IME (input-method editor) is an application that allows a standard keyboard (such as a US-101 keyboard) to be used to type characters and symbols that are not directly represented on the keyboard itself. In China, Japan, and Korea, IMEs are used ubiquitously to enable standard keyboards to be employed to type the very large number of characters required for writing in Chinese, Japanese, and Korean. 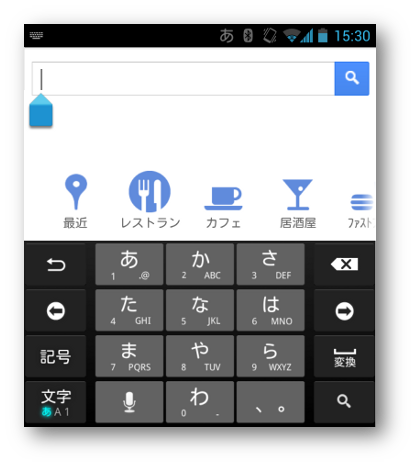 On platforms with touch-based input device such as mobile phones, an IME also plays a role to type text that a simple on-screen keyboard cannot type directly. A system IME is an IME already installed on a user's system. An IME consists of two modules; a composer and a converter. A composer is a context-free parser that composes non-ASCII characters (including phonetic characters) from keystrokes, e.g. Hiragana or Pinyin. A converter is a context-sensitive parser that looks up a dictionary to convert phonetic characters to a set of ideographic characters, e.g. Kanji. An IME clause is a grammatical word produced in an IME. An IME selected clause is an IME clause currently being converted by an IME. An IME composition is an instance of text produced in an IME. For IMEs that can produce multiple words, an IME composition consists of multiple IME clauses. For IMEs that produce only one word, an IME composition is equal to an IME clause. When an IME receives keystrokes, it sends the keystrokes to a composer and receives phonetic characters matching to the keystrokes. When an IME receives phonetic characters from a composer, it sends the phonetic characters to a converter and receives the list of ideographic characters matching to the phonetic characters. The following figure shows the basic structure of an IME. A composer consists of two types of composers: a phonetic composer and a radical composer. A phonetic composer composes a phonetic character from its ASCII representation. A radical composer composes a phonetic character from phonetic radicals. A phonetic radical is a character component of a Latin character, a Chinese character, or a Korean character. A Latin character can consist of an ASCII character and accent marks, e.g. the character ‘á’ consists of the ASCII character ‘a’ and the accent mark ‘´’. A Chinese character can consist of Chinese character components that refer to its semantic origins, e.g. the Chinese character ‘略’ consists of two components ‘田’ and ‘各’. A Korean character consists of Korean character components that represent consonants or vowels, e.g. the Korean character ‘가’ consists of the consonant ‘ㄱ’ and the vowel ‘ㅏ’. A composition window is a window that shows ASCII characters being composed by phonetic composers or phonetic radicals being composed by radical composers. An IME usually shows the text being composed by a composer with its own style to distinguish it from the existing text. 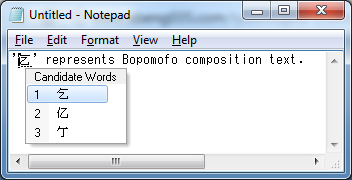 Even though most of composers output phonetic characters, some composers (such as Bopomofo composers) output a placeholder character instead of phonetic characters while composing text. Phonetic composers are not only used for typing Simplified Chinese and Japanese, but also used for typing non-ASCII characters (such as mathematical symbols, Yi, Amharic, etc.) with a US-101 keyboard. Each of these languages has a mapping table from its character to a sequence of ASCII characters representing its pronunciation: e.g., ‘か’ to ‘ka’ in Japanese, and; ‘卡’ to ‘ka’ in Simplified Chinese. This mapping table is called as Romaji for Japanese and Pinyin for Simplified Chinese, respectively. A phonetic composer uses these mapping tables to compose a phonetic character from a sequence of ASCII characters produced by a US keyboard. 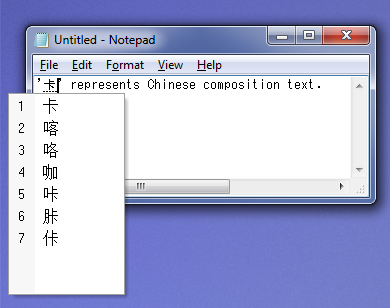 An example of a phonetic composer for Simplified Chinese outputs the ASCII characters that were input by the user, as its composition text. On the other hand, a typical phonetic composer for Japanese outputs phonetic characters when the typed ASCII characters have corresponding phonetic characters. 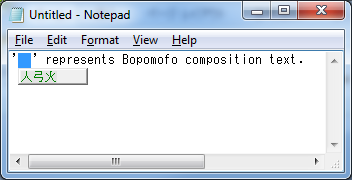 An example of a phonetic composer for mathematical symbols outputs composed mathematical symbol and shows the source keystrokes in its own window, which is an example of a composition window. Radical composers are mainly used for typing Traditional Chinese and Korean with phonetic keyboards. Each phonetic keyboard of these languages can produce phonetic radicals: e.g., typing ‘r’ produces ‘ㄱ’ on a Korean keyboard; typing ‘o’ produces ‘人’ on a Traditional-Chinese (or Bopomofo) keyboard, etc. A radical composer composes a phonetic character from phonetic radicals given by these keyboards: e.g., typing ‘ㄱ’ (r) and ‘ㅏ’ (k) produces ‘가’ on a Korean keyboard; typing ‘人’ (o), ‘弓’ (n), and ‘火’ (f) produces ‘你’ on a Traditional-Chinese keyboard, etc. A radical composer for Korean outputs the phonetic radicals as its composition text. A radical composer for Traditional Chinese outputs a placeholder character (U+3000) and shows the phonetic radicals being composed to its own window. This window is an example of a composition window. Some platforms (such as Mac and Linux) use radical composers for typing accented characters used in European countries. For example, typing ‘ ̈ ’ (option+u) and ‘a’ (a) produces ‘ä’ on US keyboards of Mac. On touch-based platforms without hardware keyboard like mobile phone or tablet platforms, some kind of on-screen keyboard is displayed to help a user typing text, which occupies some part of the screen. A user uses this keyboard to type composition text. The layout of an on-screen keyboard may vary depending on language or its input modality (e.g. 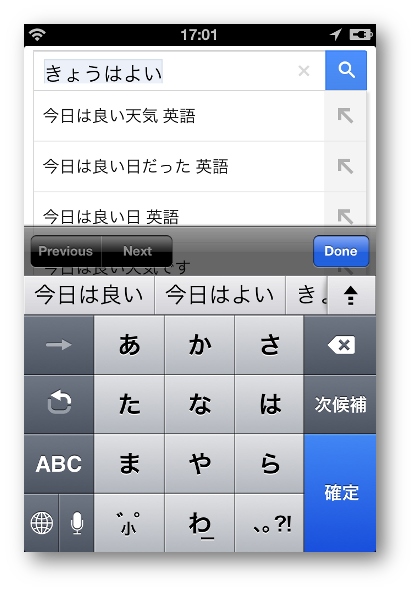 a telephone number input field requires number buttons only). 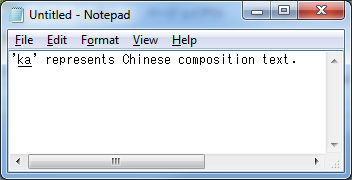 A converter is a context-sensitive parser used for replacing the outputs of a composer to ideographic characters on Chinese, Japanese, and Korean. Korean seldom uses ideographic characters. Because Chinese, Japanese, and Korean have many homonyms, each sequence of phonetic characters usually matches many ideographic characters: e.g., a Japanese phonetic character ‘か’ matches Japanese ideographic characters ‘化’, ‘科’, ‘課’, etc. ; Pinyin characters ‘ka’ matches Simplified-Chinese ideographic characters ‘卡’, ‘喀’, ‘咯’, etc. ; Bopomofo characters ‘人弓’ matches Traditional-Chinese ideographic characters ‘乞’, ‘亿’, ‘亇’, etc. A converter looks up a dictionary and shows a list of candidates of possible ideographic characters so a user can choose one. This list is known as a candidate list. A candidate list is known as a candidate window when it has its own window. 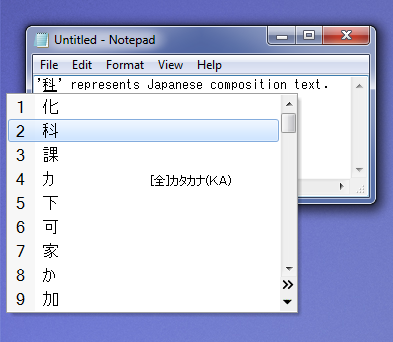 Some Japanese IMEs show annotations in its candidate window for a character that is not so easy to distinguish from other characters (such as full-width alphabets, full-width Katakanas, and half-width Katakanas, etc. ), as shown in the following figure. The next figure shows a candidate window of a Simplified-Chinese IME. And the next figure shows a candidate window of a Traditional-Chinese IME. Some techniques are used to improve conversion quality. 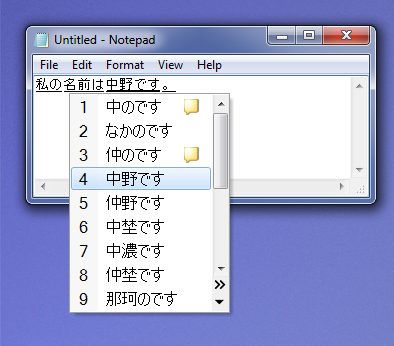 For example, a converter integrates an MRU (Most-Recently Used) list. Even though there are many ideographic characters for each phonetic character (or phonetic radical), a user does not usually use all these ideographic characters. A converter uses an MRU list to filter out ideographic characters not used so often from a candidate list. Another example is a grammar parser. A converter that integrates a grammar parser splits the given phonetic characters into grammatical clauses and converts only one clause at a time. When a sequence of phonetic characters consists of n clauses and the i-th clause has m_i candidates, the total number of the candidates for the input characters becomes (m_1 * m_2 * … * m_n). To reduce the number of candidates owned by a converter, a converter usually processes one clause at a time. This clause is called the selected clause. An IME usually renders a selected clause with a special style to distinguish it from other clauses, as shown in the following figure. When a converter converts two or more clauses, it chooses candidates for the selected clause so it becomes grammatically consistent with the surrounding clauses: e.g., Japanese converters usually output ‘危機一髪’ (not ‘危機一発’) for Japanese phonetic characters ‘ききいっぱつ’ because ‘危機一発’ is grammatically incorrect. 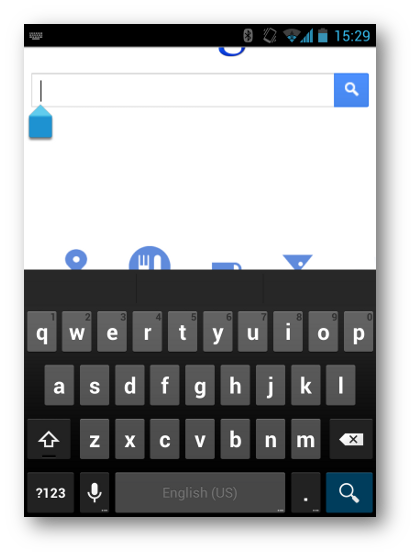 On a mobile platform, candidates may not appear in a separate window, but occupy some part of the screen for the user to choose the candidate word that they intend as a part of on-screen keyboard. Implementations that use ECMAScript to implement the APIs defined in this specification must implement them in a manner consistent with the ECMAScript Bindings defined in the Web IDL specification [[WEBIDL]], as this specification uses that specification and terminology. Authors can get an object which implements the InputMethodContext interface on an editable element, which can get keyboard input first (i.e. a “target” element). If this property is accessed on a non-editable element, a user agent SHOULD return a context for the innermost editable or focusable element to the element. In this case, the target property in the InputMethodContext interface points to the target element. If all ancestors of an element are neither editable nor focusable, this property returns null. To control the IME attached to an element, it is a good idea to add this property to the HTMLElement interface. Returns an InputMethodContext interface associated with this element. To change the behavior of the IME associated with an element, authors MUST first obtain an InputMethodContext interface from the inputMethodContext property of the HTMLElement interface. The returned InputMethodContext interface MAY not be directly associated to the element. An interface MAY be shared among elements under an innermost editable or focusable element. In that case, target property in the InputMethodContext interface points to the element which owns the interface. This event should be fired immediately after the IME candidate window is set to appear, which means immediately after the position information for the candidate window has been identified. To get a better performance, these events are of the generic "Event" interface and fired directly to the InputMethodContext object. They do not bubble or capture through the DOM tree. Event handlers for these events will be able to use the "this" property of the event, or event.target / event.currentTarget to refer to the InputMethodContext object upon which the event is firing. These events are not cancellable, meaning that the appearing of the candidate window cannot be controlled via these events by cancelling them. Web applications need only register for these events once per element (the handlers will remain valid for as long as the element is alive. The IME candidate window has been identified as needing to change size (but before animating to the new position) as a result of displaying new/changed alternatives or predictions. The IME candidate window has been identified as needing to change size (but before animating to the new position) due to user-zoom, browser frame resize, or other action that changes the candidate window placement. In either case, the event should be fired after the new size/location of the candidate window is known by the user agent. This event should be fired after the candidate window is fully hidden (after the dismissal animation has ended, if there is any). The event handler code will see that no DOMRectReadOnly can be obtained inside this handler. Represents the element associated with the InputMethodContext object. Once a target element gets deleted or modified not to accept any input, any access to the InputMethodContext interface through the object has no effect. Any method calls will just return, accesses to target will return null. Represents the starting offset of the composition relative to the target if a composition is occurring, or 0 if there is no composition in progress. For composition occurring on an <input> or <textarea> element, the compositionStartOffset is the starting offset of the composition within the target's value string. For compositions occurring on an element with the contentEditable flag set, then this is the starting offset relative to the target's textContent property (textContent is a linear view of all the text under an element). Represents the ending offset of the composition, in a similar way to compositionStartOffset. An web application may use this information to explicitly control the position for its own input-related UI elements, such as search suggestions. Returns a copy (per call) of the current list of alternate candidate strings from the InputMethodContext object. The InputMethodContext object can produce alternates while it has a composition in progress. When no composition is going on, getCompositionAlternatives() will always return an empty list. The list of alternatives is not updated "live"; it is only updated between compositionupdate events. This specification provides an interface for developing IME-aware Web applications. This section describes practices for some use-cases. Once a InputMethodContext interface is obtained, it should be valid for the lifetime of its target element's lifetime, as long as the element is editable or focusable. Once the target gets disabled, authors MAY NOT access an IME through the interface even after the target gets enabled again. Once the target is deleted, any access to the interface is void. Any access to the InputMethodContext interface makes sense mostly when the target element has focus. In other words, it makes little sense if you access the interface when the target element doesn't have focus. The editors would like to thank Brendan Elliott, Jianfeng Lin, and Travis Leithead from Microsoft Corporation for their technical feedback and assistance.